← Wine Geek – Know Thyself! The recent harvest wasn’t a disaster everywhere, after all. Portugal’s Douro Valley enjoyed exceptional weather and a “classic” harvest, according to Miguel Roquette, marketing director for Quinta do Crasto winery, which his family has owned for more than a century. Crasto (pronounced crash-tow) has been one of the leading Douro wineries in producing dry table wines from traditional Port grape varieties, a movement begun in the 1990s. I had the chance to chat with Roquette during his visit to Washington last week. 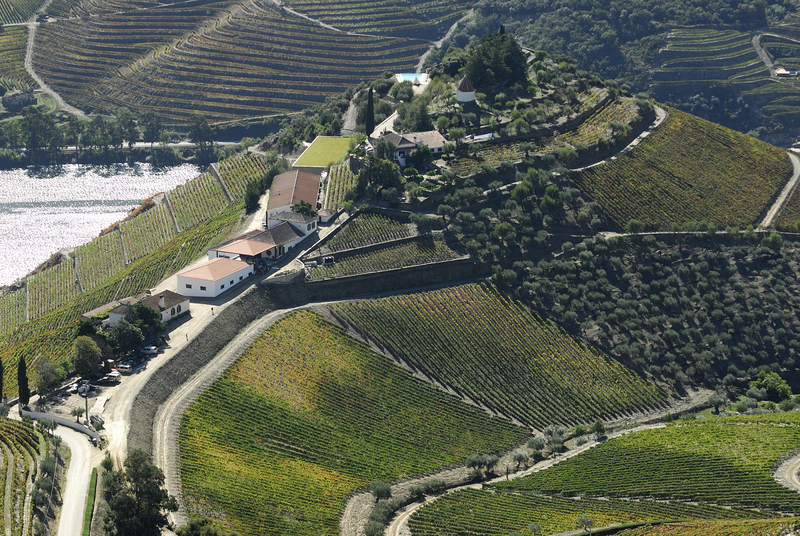 Quinto do Crasto sits on a promontory overlooking the Douro, in one of the world's most beautiful wine regions. How was the vintage in Portugal? Not as bad as everywhere else, I hope. This may be the best vintage ever for table wines in the Douro. Of course, we’re only talking since ’94 on that score. We had a hot, dry and sunny summer and harvest. The only problem may be that it was too hot. But even for Ports, I think this will be a classic year that everyone will declare a vintage. I shouldn’t jinx it of course – we will make the first assessment in February after the wines have settled down, and the final decision in the Spring. I’ve seen more Crasto wines in retail stores recently. Is that a sign of increasing popularity? Well, I hope so, but it’s also a factor of supply. We now have more than 200 hectares [about 500 acres] of vineyards, at Crasto and at our other estate, Quinta da Cabreira in the Douro Superior, further east near Spain. At Cabreira we grow our white wine as well as traditional red varieties. We’ve just released a new wine, the 2008 Crasto Douro Superior, made from Cabreira grapes. What else is new for Quinta do Crasto? So while we emphasize traditional viticulture and grape varieties, and we continue to tread grapes by foot, we are using modern science and equipment to improve the quality and preserve the character of the wines. In addition to the Douro Superior, this year we will be releasing a new Port, to be called Quinta do Crasto Finest Reserve. It will be below the Late Bottled Vintage port, and at about half the price, around $15 a bottle. We are also getting into the olive oil market. We have olive trees at Crasto that we’ve always used to make oil for the family, but now we are exploiting the different varieties of olives and selling the oils at retail. And we’ve opened a wine store at Crasto. Tourism is booming in the Douro! Quinta do Crasto wines are imported by Broadbent Selections and distributed in the DC area by Select Wines. Photo courtesy of Quinta do Crasto. This entry was posted in Douro, Portugal, Wine and tagged Douro, port, Portugal, Wine. Bookmark the permalink.